Oh my gosh… when I recall the typical school yard scrapes of my youth, what was always worse than the scrape/cut itself was the trip to the nurse’s office, where hydrogen peroxide was used to clean the wound – excruciatingly painful, and the bubbling up may dislodge debris, but it’s so harsh. Or my mother – bless her heart – dabbing rubbing alcohol… OUCH! Might’ve killed some bacteria, but also irritated the wound as well as the surrounding healthy skin. I was actually the one who introduced her to Neosporin (came out some time in the 50’s), after one of my little friend’s mom applied it after an injury in their back yard, so all of my younger sibs have me to thank! Seriously, if I was ever abandoned on a desert island – something I’m sure my husband has been tempted to do on more than one occasion 🙂 – this would be on my top ten list of things to have with me. My pediatrician had told me a long time ago that I should never put anything on my sons’ wounds that I wouldn’t put in their eyes… clean it with water, apply pressure with for a few minutes with gauze or clean cloth, then keep it moist with ointment and covered. (Another fallacy put to bed – Mom always believed in “airing out” a wound, but the doc told me that just dries out the wound, and leaves you open to bacteria and infection.) Skin WILL regenerate beneath the ointment. I actually ordered this original formula tube by mistake, usually getting the “pain relief” formula… don’t get me wrong, this one does the trick in healing wounds just as well as the other (neither hurts when applying), but the Pramoxine HCI (10mg) analgesic is especially helpful with burns (there is ALWAYS a tube of it in one of my kitchen cabinets!) There’s a tube in each of our bathrooms, and each of our cars (has come in quite handy a time or two during excursions with the grandkids!) The three antibiotics are the same in both types, in slightly differing amounts per each gram – Bacitracin Zinc (400 units in original formula, 500 in pain relief formula), Neomycin Sulfate (both 3.5mg), and Polymyxin B Sulfate (5,000 units in original, 10,000 units in pain relief), and both are for use in helping prevent infection from cuts, scrapes and burns (it does say to ask a doc prior to using for deep or puncture wounds, animal bites, or serious burns.) Some folks are allergic to neomycin, and a co-brand called Polysporin is available with only the other two antibiotics. All of the previous three have a petroleum jelly base, but there is also a cream version of the pain relief formula with the analgesic but without the bacitracin, which isn’t stable in a petroleum base. The $6.49 I paid for the original formula on Amazon was a good price for this one ounce tube; I’d been a bit concerned about the expiration date with it being the first time I’d ordered on-line, but I ordered it September of 2017 and it doesn’t expire until March of 2019. Trust from experience. This ointment works. 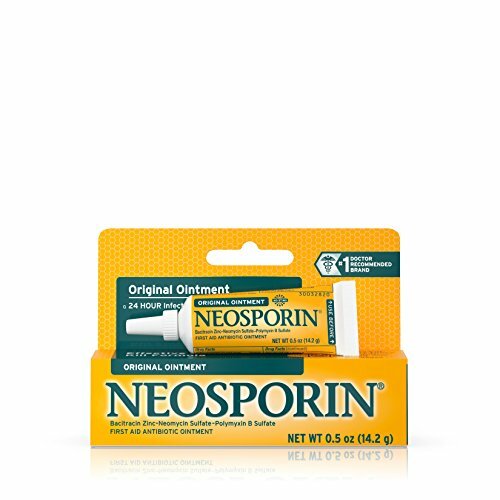 On large open injuries, I use NEOSPORIN to cover infected area and any possible scarring skin. When the suggest used time is over I than cover area with honey. From experience, I can say, I have killed infections and minimize scares.